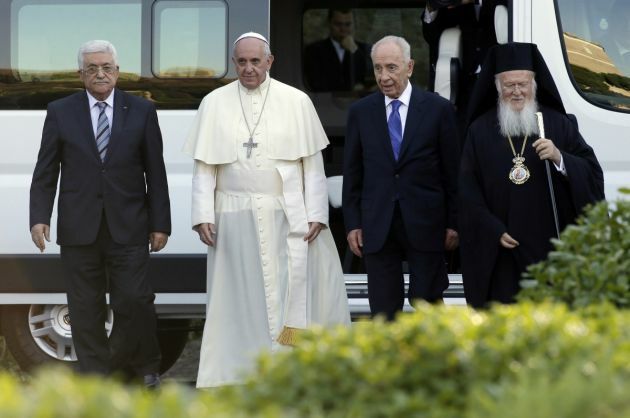 (Photo: REUTERS / Max Rossi)(L-R) Palestinian President Mahmoud Abbas, Pope Francis, Israeli President Shimon Peres and Patriarch Bartholomew, spiritual head of the Orthodox Christians, arrive at the Vatican Gardens to pray together in the Vatican June 8, 2014. Opening a diplomatic mission to the Vatican, Palestinian president Mahmud Abbas has warned that moving the U.S. embassy in Israel to Jerusalem from Tel Aviv would "not help the peace process. Pope Francis met with Abbas at the Vatican on Jan. 14 in a private meeting before the Palestinian leader headed to inaugurate the diplomatic mission. It is located in a building facing the Vatican that also houses the embassies of Peru and Burkina Faso. "I met with His Holiness. The Vatican has fully recognized Palestine as an independent State, I hope that other States take their example from the Holy See," Abbas later told journalists. Their meeting was the day before senior diplomats from world powers gathered in Paris to affirm their stance on peace talks between the Israelis and Palestinians. Neither the Israelis nor the Palestinians were invited to the meeting. About 75 governments and international organizations used the meeting to send a message to U.S. President-elect Donald Trump that the only viable solution to the conflict is the creation of a Palestinian State alongside Israel. Noting that a new administration was poised to take power in Washington, French President François Hollande said that decades of talks to create a Palestinian state can't be "improvised or overturned." "This solution is the only one possible for peace and security," Hollande said during the meeting. The Paris conference marks another flashpoint over Israel between the international community and Trump, who has vigorously backed the Israeli government since winning the election, The Wall Street Journal reported. Trump's team objected to the conference in talks with French diplomats ahead of the meeting, a French official involved in the discussions said. "They made it clear that they did not think it was a good idea," the official said. The Trump transition team couldn't be immediately reached for comment. U.S. Secretary of State John Kerry was at the Pairs meeting, one of his last before handing over control of U.S. diplomacy to the Trump team. Earlier, the Vatican had released a statement on Israel after the papal meeting. It noted, "Hope was expressed that direct negotiations between the parties may be resumed to bring an end to the violence that causes unacceptable suffering to civilian populations, and to find a just and lasting solution." AFP reported that in brief words with journalists, Abbas said he remains opposed to Trump's pledge about the possible transfer of the U.S. embassy to Jerusalem. "We cannot say anything yet because it has not happened, but if this does happen it will not help the peace process. I hope it will not happen," said Abbas, speaking in Arabic. The Vatican statement after the meeting said that both parties "evoked the existing good relations between the Holy See and Palestine, sealed by the Global Agreement of 2015, which regards essential aspects of the life and activity of the Church in Palestinian society." It said that in this context, mention was made of the important contribution of Catholics to favouring the promotion of human dignity and assistance for those most in need, especially in the fields of education, health and aid. Among the gifts exchanged, Abbas offered the pontiff a stone from the Church of the Holy Sepulchwe in Jerusalem, according to Greg Burke, spokesman for the Holy See, Italy's Corriere della Sera newspaper reported. The private meeting between Francis and Abbas was their third audience. The Pope visited Israel and the Palestinian Territories in 2014 and Abbas made a trip to the Vatican the following year for the canonization of two Palestinian nuns.